Rooted in African American culture of the early 20th century, swing dancing was inspired by the rise of jazz music, and reached its height of popularity in the 1940s. The dance evolved rapidly, as young people modified their movements according to changing musical styles, creating a partner dance which emphasized expression, personality, musicality, and the lead/follow connection techniques needed for un-choreographed social dancing. Today, "swing dancing" is an umbrella term for the family of dance styles from that era, and includes Charleston, Lindy Hop, Balboa, and Shag, all of which are danced to music with a swing rhythm. 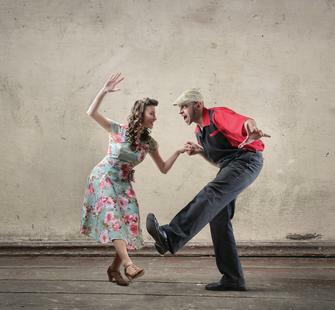 In this class, you will learn the basics of partnered Charleston and 6-count Lindy Hop, and get an introduction to the history behind this beloved and all-American art form.